I have had my share of Mexican sauces in the past, and there is always one that stumps me at El Rey, one of my favorite Mexican restaurants in Milwaukee. 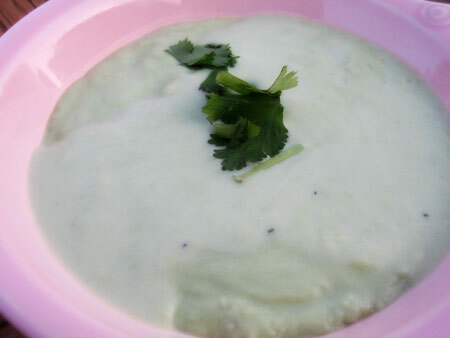 I do not see it there often, but it is a green salsa, almost creamy, but with a bite to it. I often am curious if avocados are involved, but immediately think that avocados turn brown after some time due to oxidation. I shopped at El Rey this past weekend, and avocados were on sell, so I decided I would attempt to make some sort of sauce for my Saturday fiesta, including shrimp diablo and carne asada. This sauce is so easy to make, and is perfect, as it can be used on tacos, burritos, or heck, even chips. It is creamy with just the right about of heat. Begin by cleaning your avocado. With your knife cut into the middle of the avocado, running your knife around the entire avocado, back at your starting point. Turn with both hands, exposing the seed. With your knife, whack into the seed, and turn slightly to remove. Now with your knife, slice lengthwise, then crosswise, being careful not to cut through the skin of the avocado and into your hand! Now, with a spoon, scoop out and toss everything into a blender. Add the remaining ingredients, and puree down until you have a nice creamy sauce. That is it. So simple, so delicious. Enjoy.